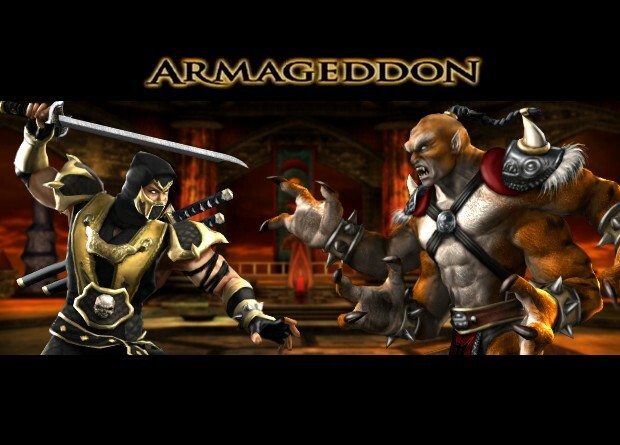 Over on the Midway Boards, three more loading screens from Mortal Kombat: Armageddon, featuring Raiden vs. Fujin, Scorpion vs. Kintaro and Noob vs. Smoke were released, along with a video of Motaro vs. Sheeva and part 2 of the Mileena vs Kitana gameplay video. Also, over on the Official Website a high-definition (720p) version of the MK: Armageddon Intro Movie is available for download here and on the "question mark" page. 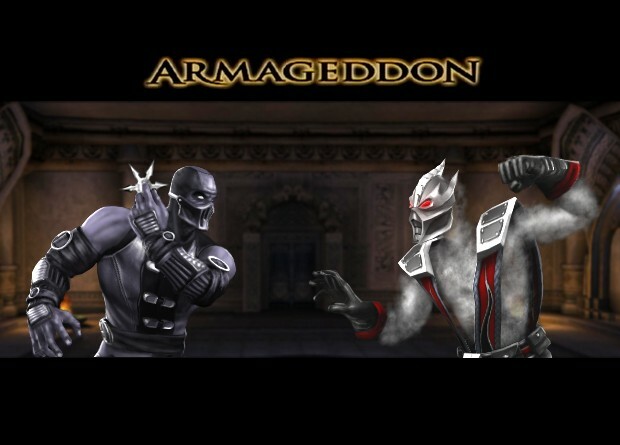 Mortal Kombat: Armageddon is the last chapter in the current generation of Mortal Kombat games. Featured only on Microsoft Xbox and Sony PlayStation 2, the game will have the largest roster of characters and also feature a new "kart" racing mini-game dubbed Motor Kombat. The game will also appear on the Nintendo Wii in the first quarter of 2007. Got Any Of Reiko Or Rain, Maybe Even Onaga The Dragon King? For starters, try here for all of the MKA Videos MKA Videos Then browse here for all of the MKA Vs Screens MKA Vs Screens Finally, browse here for all of the MKA news, Videos Vs Screen Shots and Loading Screens, blah blah blah, yadda yadda yadda. Plus all and anything else MKA related. MKA Various Your welcome. I like the intro Hi-Res and the Scorpion screen is my favorite from those, the Raiden one looks good too. The high rez intro is simply the best I have viewed. What about Kintaro, Kona? He looks good as does Fujin. This game is gonna rock the house! And it's going to be a tough act to follow. If you get my drift? M.K.A. Will Never Be Topped. Konquest Is Legit, Designing Your Own Character Is Awesome, The Online Play Will Be GREAT, And This Being The First MK That Lets You Be All Of The Characters Makes It Even More Awesome. And Yeah The Hi Rez Video Is A 10 Outta 10. 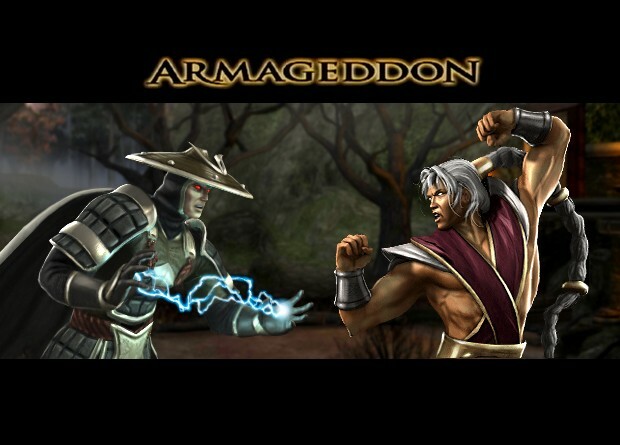 So Far The Loading Screens I Like Most Was Raiden Vs Fujin & Kabal Vs Mavado. MKA will be topped, eventually. Otherwise how can the franchise continue to improve and expand onto the next generation of gaming consoles and systems? Just because this game is the equivalent of a massive hamburger with the lot, doesn't mean that future MK games won't be far more advanced and incorporate more sophisticated features. And I'm not just talking about game engines, graphics, and all of the rest of the high tech crap. I'm talking about characters that look as real as the the ones featured in the opening sequence of MKA. One day soon that will be how good gaming, and I mean ingame graphics and prerendering will look. If not better. Also, just because MKA is cram packed with 60 + characters and all of the rest of the hoohaa. Don't think that makes for the best MK game ever. Sure, it's the best, or rather, going to be the best on this generation of systems. But I'm positive that the next stepping stone in the MK gaming saga will wipe the floor with MKA. What I Think Boon Will Do Is Make This The MK One Of Their All Out Games, Kill Of Some Dudes And Quote On Quote Call This The Last MK Hoo Rah And Then Like Years An Years Later When Gaming Is More Advanced Bring MK Back. Star Wars Did It With Episode 1-3 They Waited Until Special Effects An Stuff Were More Advanced And Came out With The Episodes 1-3 After 4-6. And They Did That With Alot Of Other Stuff. MKA Is The Best And Will Be For A long Time An Then Like A Decade Later or Sumthin I Think They Will Try An Out Do it. The next Mortal Kombat fighting game "MK8" will be released around late 2008, perhaps early 2009. Give or take a few months. I'm just guessing for the most part. But it won't be 10 years, dude. And that's pretty much all irrelevant right now. Because I just want to play MKA, damnit. Oh Yeah Man I Hear That MKA Is Gonna Kick. Plus I'm Pumped Cause I Want To Be Reiko Again And I Wanna Play The New Konquest! Its Gonna Be Released Oct 9, My Birthday Is The 11th So I'm Definatly Getting It Right Away.